The agreement – which follows extensive analysis and tests on AkzoNobel’s products and business processes – means the company has become a certified supplier of vehicle refinishes to more than 50 auto companies in China over the last 20 years. “Becoming the recommended supplier of automotive refinishes for Mercedes-Benz China shows great recognition for our products, colour expertise, digital tools and services,” said Keith Malik, Key Account Director for AkzoNobel’s Vehicle Refinish and Automotive business. It’s not the first time AkzoNobel has supplied products and services to Mercedes-Benz. Back in 2014, the company entered into a framework agreement with Daimler AG for automotive refinishes. 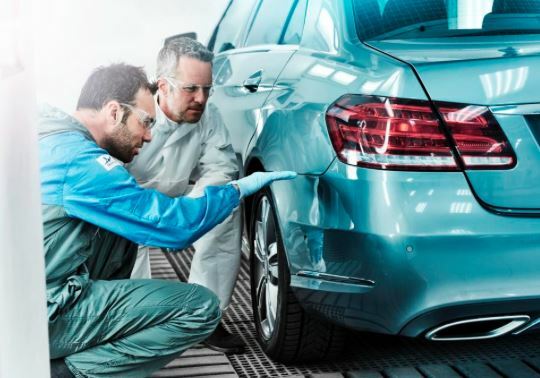 This involved becoming one of the certified suppliers of its global dealers and bodyshops, which also covered the passenger and commercial vehicles of Mercedes-Benz, as well as its Smart brand. In addition to supplying its Sikkens brand, AkzoNobel provides the auto maker with a wide range of digital solutions. This includes the handheld Automatchic Vision spectrophotometer. The precise color-matching device helps auto repair shops to increase operational performance and significantly reduce wait times for car owners. The agreement also includes the supply of an intelligent system which helps to increase the efficiency and quality of repair shop management. This is achieved by intuitively and accurately tracking and managing the entire refinishing process via a single interface. Another innovation, known as E-zyrefinish, provides end-to-end services including data analysis, order processing, warehouse management and transportation, which reduces costs while increasing productivity.